Interview from a meeting at Udin&Jazz, June 28 2008 published in the Rivista della Fondazione Isabella Scelsi in Italian. Luciano: Tell me about the sordinos you redesigned with Giacinto in the 70's. FM Thank you Luciano, First I'd like to say that technically speaking, they aren't mutes at all as mutes are used to dampen the sound- but they are actually resonators designed to produce a low rumble. When I asked Giacinto why he wanted to incorporate this sound into the second quartet and Triphon, he said that this sonority reflected certain Tibetan ritualistic practices wherein a ground tone, or vibrating sound was produced to evoke a certain magical power along with the Tibetan flutes trumpets and chanting monks. As a practitioner myself, I haven't been able to verify these practices in the Buddhist canon; perhaps it was a visionary interpretation derived from his own meditative experiences. Luciano When did this all take place? FM I met Giacinto in the mid-seventies and almost immediately began to work on his solo cello composition Triphon (1956). We soon discovered that the metallic resonator he'd developed with a New York sculptor had some basic design problems for performing musicians. When playing forte or fortissimo it vibrated so heavily on the bridge that it lost its stability; it vibrated itself loose and eventually fell off. Of course this was an impossible situation for performance. Luciano: Why did Giacinto ask you, a performer, to redesign his resonators? Luciano How did you solve this problem? FM To redesign them, two fundamental requirements needed to be addressed: uninhibited vibration on the strings and at the same time, complete stability. I decided to experiment using the same materials as the originals. During this experimentation period, one problem presented itself: in Triphon the sound of the resonator needed to be reduced or eliminated in the second movement and reintroduced in the third. Therefore the design needed to accommodate these back and forth changes quickly, without time consuming or clumsy actions of putting on and off in performance. I experimented with modifications that straddled the strings like Giacinto's resonator, but without much improvement. Only by departing completely from the original resonator did I find new model that worked; a floating "butterfly" design whose wings rested loosely on top of the strings while the body was weighted between the strings. This allows the performer to flip it backward without removing the fastenings. Later on, I made several variants of this design, weighting it down with lead. Luciano You used them for the recordings that you made with Giacinto, no? FM Giacinto liked the sound and design so much that he took me to his own lawyer who set up an appointment with a patent attorney. The attorney told us that it would be very expensive to take out a worldwide patent, pointing out that without a large commercial market, a patent wouldn't be worth it. But the lawyer added that we automatically had the copyright on them with my signature, so it wasn't pursued further. Giacinto asked me to make up several extra sets for quartets as well as some reserves. I used this model when I premiered the Trilogia in the Como Festival in 1979 and again for the recordings we made of the Trilogia both in the International Studio in Rome, and again when I recorded the Trilogia and Ko-Tha in a better acoustical space with Dutch radio producer Frans von Rossum. Giacinto agreed that these latter tapes were far superior and they were eventually used for the Raretone vinyl release and later again for the Etcetera cd release with Michel Arcizet. After changing ownership several times, it is now available through jdkproductions.com in the Netherlands. Luciano Are these older recordings available? FM While preserving the original archive of all Giacinto's tapes by transferring from reels to DAT. I did run across some recordings of Devy Erlih and others, but never found those old recordings we did in the International Studios. In any case, the published recording is the one that Giacinto and I both preferred so perhaps the first one isn't of importance. 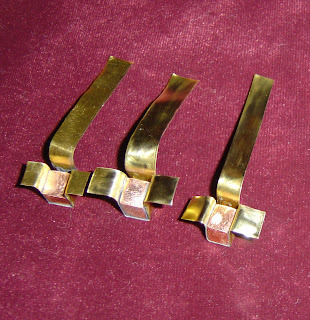 I subsequently redesigned the resonator with brass weights instead of lead, the design principle and sound being the same and recently made up a set of these for the Flux String Quartet's Scelsi series at Miller Theater, New York. It has very recently come to my attention that this design I made for Giacinto has been modified by various designers. I've not seen nor heard them. Up until now I have produced my originals upon request and hope to be able to continue this in the future.